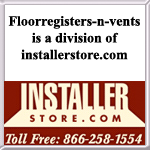 FloorRegisters-n-Vents.com has revolutionized the way to shop for floor vents and grilles! Now you can browse our full line of registers in the exact size you need! This eliminates time wasted clicking through multiple styles of registers that aren't offered in your size. Just simply click the size image or text of the size you need, and it will go directly to the floor register and grille styles available. Please Note: If you are having troubles clicking the links above while browsing on your Mobile Device, here is a link to a list of all sizes.